So you think you’ve found that perfect apartment. It’s in a great part of town, has some nice amenities, and, most importantly, the rent is well within your price range. You’re ready to sign the least, right? Unfortunately, before you start packing and loading up the moving truck, it’s a good idea to do an apartment walkthrough. 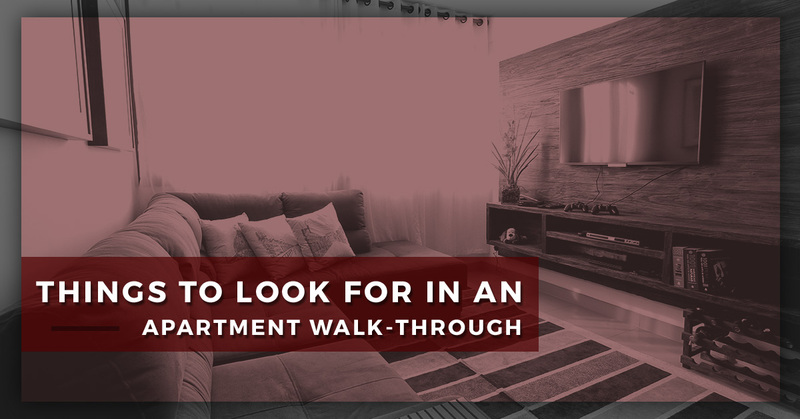 You might be asking yourself, “What’s an apartment walk-through?” Well, it’s essentially an opportunity to go through the unit with your landlord and see if there are any pressing issues that need fixing prior to your move-in date. The last thing you want to find during this step is any sign of rodent or insect infestation. Should you notice any droppings or chew marks, it’s probably in your best interest to cross that potential unit off your list. After all, you deserve to be comfortable in your own apartment. Be sure to also check the functionality of wall outlets and cable jacks. It’s the landlord’s responsibility to ensure that both are accessible and in working condition. All doors and windows in your unit should open and close without any issue. On top of this, double-check that all locks and doorknobs are secure and not wobbly. Lastly, take a look to see if window coverings are intact, including screens. If there’s a draft in your apartment, be sure to alert your landlord. Again, you’re spending hard-earned money to potentially live in this unit. It doesn’t make much sense to settle for frigid, uncomfortable temperatures because of a draft. Here at Gateway Place Apartments, we have yet to come across someone who doesn’t expect a functional bathroom in their unit. Take a few minutes to flush every toilet, check for leaks under the sink, test the hot water and shower head, etc. You rely on a number of kitchen appliances every day. That said, make sure each is up to par in terms of functionality. We’re talking about microwaves, dishwashers, garbage disposals, ovens, burners, refrigerators, etc. Don’t just limit your kitchen check to appliances, though. Now is a good time to look for stains, burn marks, or chips on the countertops. Of course, if something smells funny, notify your landlord. You’re almost done! But first, head to the bedroom and living room for some final checks. These include flipping the light switches on and off, as well as testing the A/C. Any cracks or dents in the walls and baseboards could indicate structural damage. Gateway Place is more than just another apartment complex. Picture furnished apartments where you eat, shop, and play. 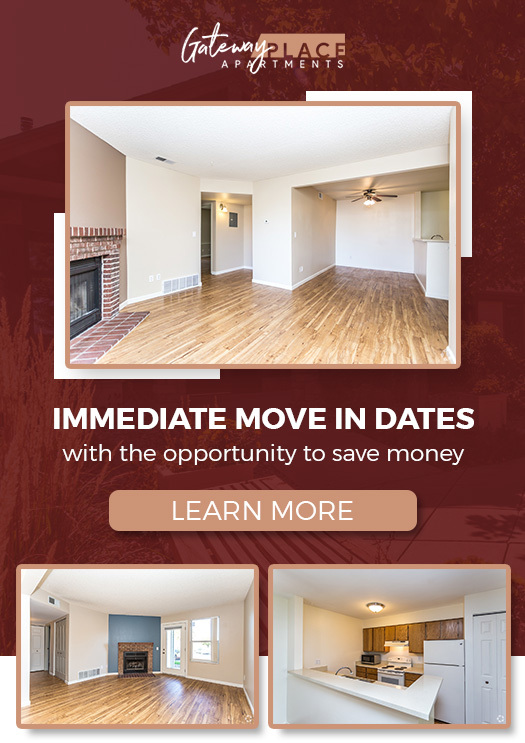 Now imagine enjoying amenities such as a spacious walk-in closet, a private balcony, or even a wood-burning fireplace. 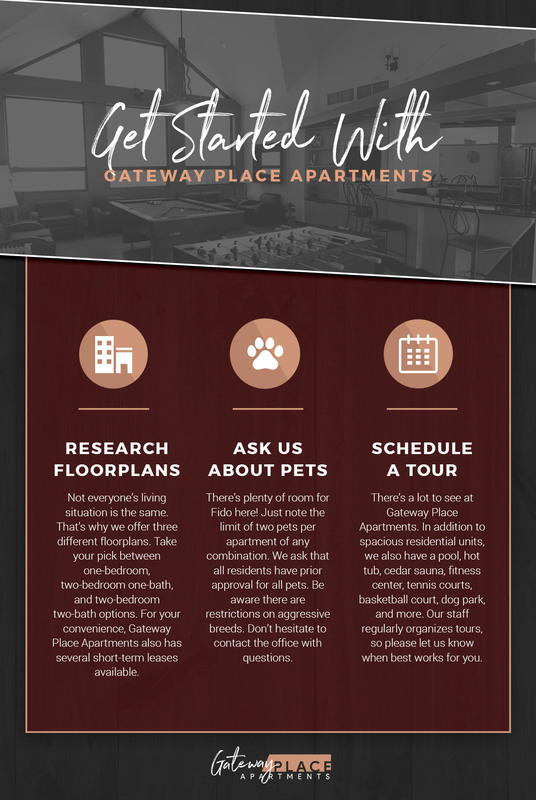 For your convenience, Gateway Place also has plenty of apartments that allow pets. In addition to our pet-friendly apartments, residents and their furry friends can take advantage of our privately owned, extra large dog park. Gateway Place is taking apartment living to the next level. Schedule an appointment with us today.